Enjoy this beautifully decorated 3 Bedroom 3 Bathroom Town Home located in The Retreat @ Serenity. 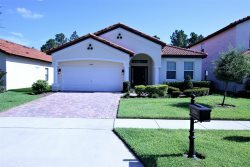 Located just a short drive from the entrance to Walt Disney World, you are also close to Walmart and restaurants, shopping and other area attractions. This new, end unit home provides you with many of the amenities we could only dream of in a vacation home! You also have the luxury of your own private Splash Pool. Decorated with Modern Furniture, Stainless Steel Appliances and many other amenities, we invite you here to enjoy your next vacation. The Kitchen provides you with every modern convenience to cook a gourmet meal or make a quick snack before taking a dip in the Splash Pool. Stainless Steel Appliances, Upgraded Small Appliances, plenty of Cookware, Dinnerware and Silverware for you and your guests. The Dining Area offers you seating for Six (6) plus Breakfast Bar seating for three (3). In the Living Room you will find a large Flat Screen TV, DVD Player, Luxurious Sofa Sleeper, Leather Side Chair & Footstool and a great view to the Private Pool Area. The Pool Area provides you with seating for relaxing after a long day at the park! Come and create a vacation memory you can't wait to tell your friends about! Walmart and restaurants only 5 min away from the community. Only 4 min away from the road in US 27 and 6 min from US 192 that is access to Disney Worlds Theme Parks, Orlando I-4 is only 18 min away where you have easy access to other attractions, like IDrive, Universal, Legoland, Airport, Clearwater, Tampa. Pool Heat: $25.00 per day (minimum 3 days) – upon request. BBQ Grill: Our guests are welcome to request the additional rent of the grill; is $12 per day (Minimum of 3 days). (Please Note: You will encounter construction traffic and activity as the lovely Dream community continues to grow with new vacations homes for our Guests!) Thank you!